Spring may have come and gone but Wanganui is still awash with beautiful gardens full of floral fancies. Likewise, flowers are also in full bloom at the Sarjeant Gallery. As part of the redevelopment project the four Collection Transition Assistants have been busy moving the Gallery’s collection to the new collection store at 38 Tāupo Quay. Botanical inspired watercolours by Vivian Smith and Edith Collier rest in purpose built Solander boxes, works on paper shelves guard framed and glazed Anne Noble and Peter Peryer photographs of a floral nature. Bouquets of wild flowers meticulously executed in oil paint have also made their way to the storage racks at Taupo Quay. Earlier in the project a giant cornflower seed packet by Phillip Trusttum was safely packed, moved and rehomed in the Taupo Quay collection store. 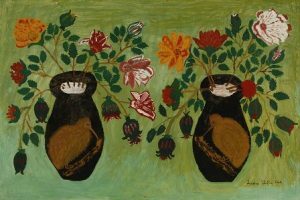 Teuane Tibbo, Fathers’ Day Flowers, 1965, On long term loan to the Sarjeant Gallery Te Whare o Rehua Whanganui. Collection of the Allen Maddox estate. With my mind occupied by pansies, poppies and peonies I thought it an opportune moment to share a few of my favourite floral works from the collection. The first is a work by self-taught Samoan born artist, Teuane Tibbo. Titled Father’s Day Flowers this symmetrical composition in bold, flat colours is typical of Tibbo’s “naive” style. Born in Apia in 1893 Tibbo did not start painting until she was 71. Another favourite is by Wellington photographer, Neil Pardington. 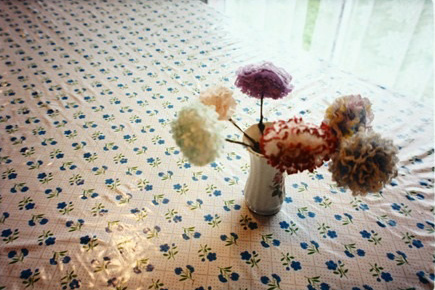 His pastel hued photograph Te Pae Pae O Te Raukura depicts a small posy of pom pom shaped flowers resting on a floral tablecloth. Te Pae Pae O Te Raukua is the wharenui at Parihaka, Taranaki. The image was taken in 2000 and formed part of Pardington’s exhibition Skylight. Lastly, Megan Jenkinson’s Evolution of the Species, photo collage combines postcard images of five women each of them decorated with smiling faced yellow and white violas. This work entered the Queens Park collection store in 1987. 27 years later it has been packed and is waiting patiently to be delivered to its new temporary home at Taupo Quay.